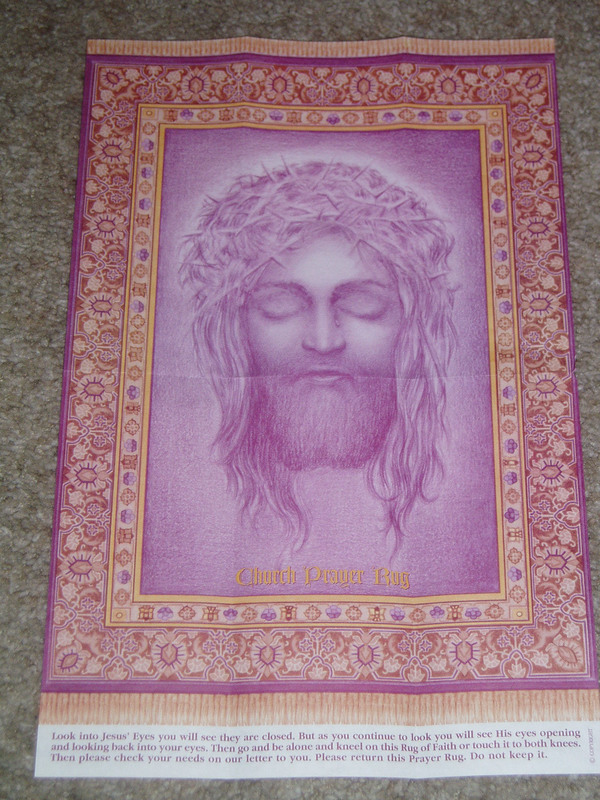 This is the "prayer rug" (read: piece of colored paper with Jesus on it) that we received in the mail today. The envelope said that it was anointed to "bless the one who's [sic] hands open this letter." Jesse and I gave it A LOT of thought and then decided that I should be the one to open it since I need the blessings more. Also enclosed in the envelope is a sealed flyer of some sort. 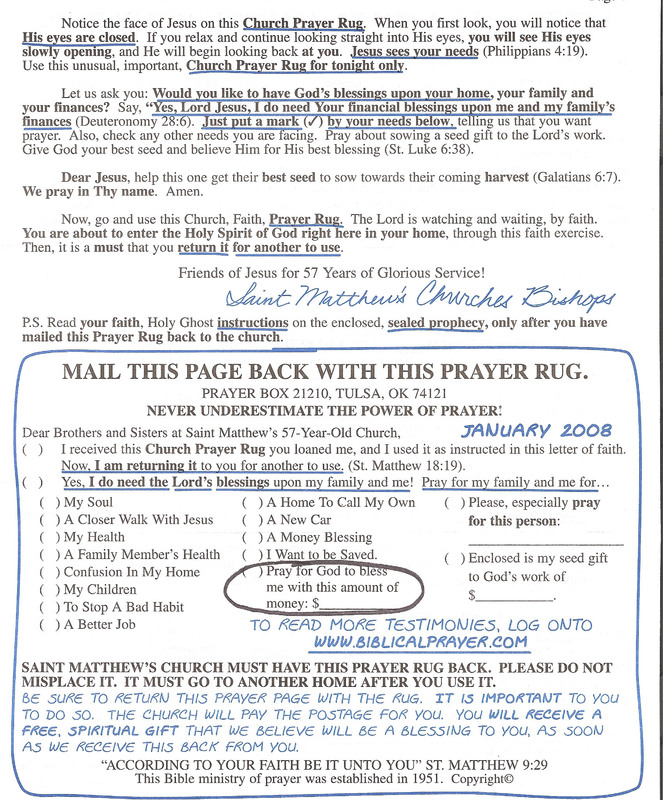 On the outside it says "Something good is about to happen… Please do not open these prophecies until after you have placed your prayer page (page two of our letter to you) and the prayer rug back in the mail before sunset tomorrow… God will help you do this." Inside, it says there is "A sign from the Lord about your future." I haven't opened it (obviously) since it is a "sacred, spiritual prophecy" only to be opened upon using (and returning) the prayer "rug"
Would you like a new car? Better job? New house? 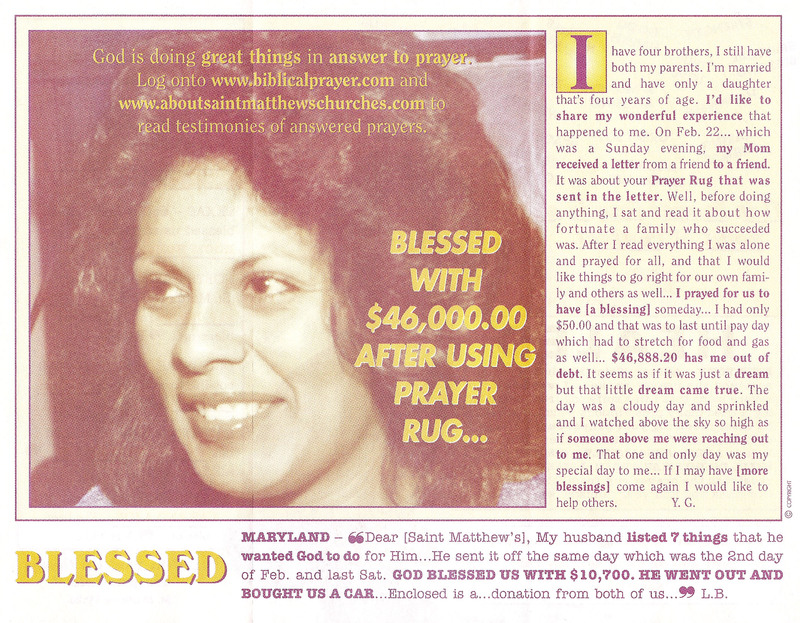 Jesus will get it for you if you return the rug before sunset tomorrow. You can even specify the EXACT amount of money you need and BAM! It will arrive in 7-10 business days. Don't believe me? So… let me know if you need anything. I'm allowed to ask for other people to get stuff too. Well, what I could really use right now is a new MacBook, but I don’t see a category for that on the check off list of options. I think the argument could be made that a new MacBook falls under the “A closer walk with Jesus” category. That’s just what the Mac faithful want you to believe. I’m dying to know… do his eyes really open and look at you? Is it kinda like the mural at the Cameron Park stake center where as you walk by, Jesus’s FOOT will follow you? Oh, yeah. Can you get me some money? Get me a buck fiddy and I’ll get some tacos. I’m not really sure about the eyes. I think it’s supposed to be like those “magic eye” pictures, but I’ve never been able to do those. As for the buck fiddy, I’ll totally buy you a taco when I come visit. I highly doubt that St. Matthews church became a 52 year old church by sitting around praying over the dollar menu. I am one of the Mac faithful, and while I don’t know that it would be “a closer walk with Jesus” I think it may qualify as “a casual stroll with a higher power”. We’re gonna sell our place this spring and buy a house. Ask Jesus to get me a good deal and make some serious money. Oh, and fixing my heart would be nice too. Can you see I have a problem with priorities? I HAVE TOTALLY GOT ONE LIKE THAT BEFORE! I am such a dork it made me happy and I kept it. hee hee! What????? You KEPT it??? Did you not see the part where it said how important it was that you not keep the prayer rug? There are other people out there who need to be blessed by it, you know.